Richard Bangs once wrote that wild rivers are the earth’s renegades, defying gravity and dancing to their own tunes. 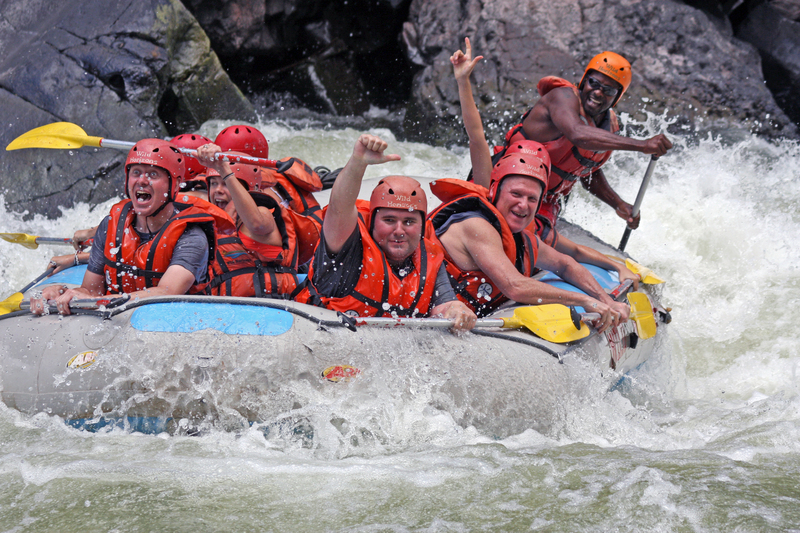 Your first glimpse at the raging rapids that roll and churn down the Zambezi awaken the adventurer inside you, taunting you and seducing you. They beckon with their tremulous arms, teasing with their spurts of white water and daring you with their coiling waves. The Zambezi is a moving, breathing part of the earth. It is the vein through which life flows and thrusts. Every stroke of your paddle takes you further than a vehicle on the road ever could. They say the first river you raft runs through the rest of your life. It bubbles up in you, the memories swirling like eddies in the pit of your stomach each time you remember it. 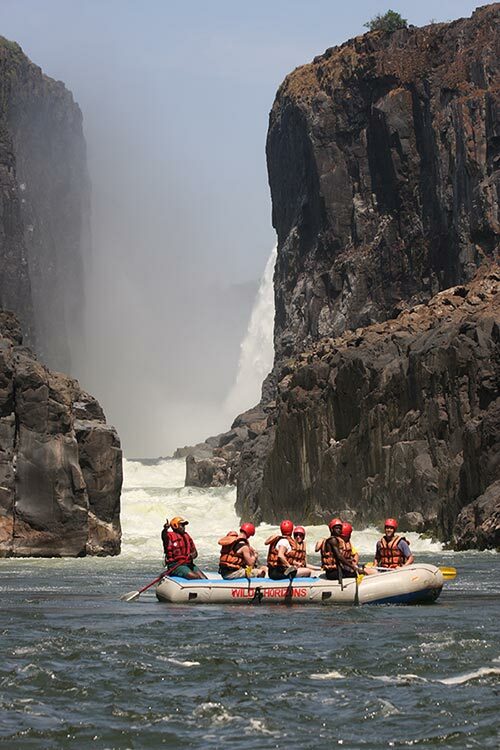 The Zambezi morphs in shape and stature when the water levels drop or rise, yet each experience is exhilarating in its own way because life is simple- For fun, just add water. When water levels drop, thrill levels soar. Between August and December, the river seems to be racing itself, plunging furiously between the lips of the gorge, cascading dramatically around very boulder and corner. It toys with the rafts with such precision, that every flip seems pre-meditated. During this time, expeditions begin at rapid number 1, the “Boiling Pot”. You take off from the white water rafting factory- the base of the Victoria Falls. The roar of the river diving down 100 meters of black basalt rock creates an ambience of adventure, purring at your inner adrenaline junkie. If you are after a heart racing, eye widening, and mind blowing rafting trip, then low water is what you need, and you have between August and December to get it. During the high water seasons (January, February, March, May, June, July), gallons of water crash down the Victoria Falls, streaming into the thirsty gorge, and flooding the rocks and outcrops that form the rapids. When you dip your fingertips in to rippling water, you touch the last of what has gone before, and the first of what is still to come. At these times of the year, the river is more subdued, relaxing after a thunderous low water race. However, the sheer volume of water makes the first ten rapids unrunnable, and thus rafters will only tackle rapid 11 (The Over lander Eater) through to number 23 (The Morning Shave). As the water levels continue to creep higher and higher around March, rafters respectfully leave the Zambezi to her own devices, until they drop again around June. The Zambezi was designed by the dare devil in Mother Nature, and there is no theme park in the world that could ever compete. Contrary to popular belief, the river is not one long, frothing rapid. The “Devils Toilet Bowl”, “The Stairway to Heaven” and “Mothers Revenge” (just to name a few) spring before you in short, dramatic bursts. The stretch of water between them is gentle and smooth- the calm before the storm. They are just long enough to allow you to drink in the incredible scenery and let the sun soak up the water on your skin. The soft slosh of water against the rafts is accompanied by exhilarated shouts and laughs that bounce off the walls of the gorge, as euphoric rafters share their stories and psych up for the next roller coaster. Cruising down this channel of water feels like cruising through a postcard. The most experienced photo editor in the world couldn’t enhance the beauty of the looming gorge stretching to meet the brilliant blue sky. Paddling through an exquisite crevice in the earth, flanked by indigenous flora and passing by inquisitive fauna, is humbling and breath taking in the same moment. 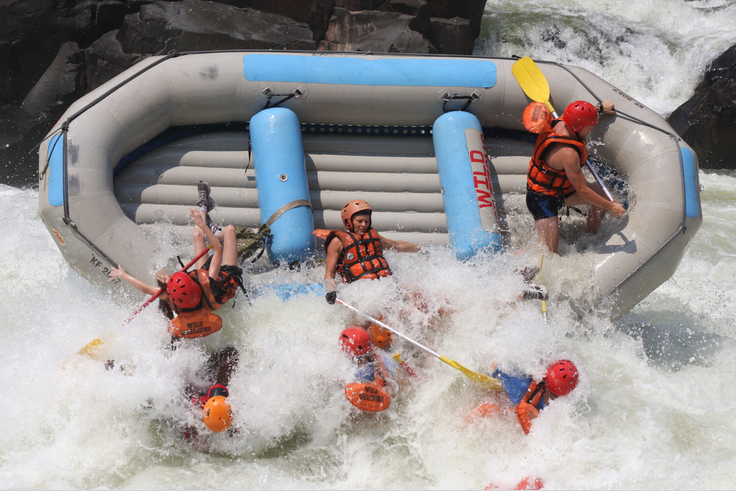 The Zambezi Low Water Rafting Season is finally here! LOW WATER rafting commenced 3 August 2017. 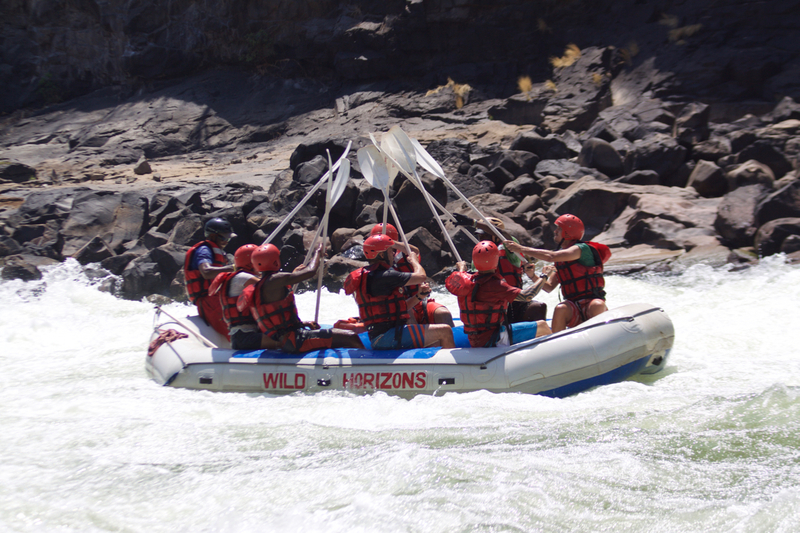 Take on the Zambezi with Wild Horizons and the finest crew on the river – Africa’s Greatest Adventures!